Backpacking in the Jotunheim National Park, Norway, 1997 - Day 2: Rain! Previous: Day 1: Travel. Index Next: Day 3: Besshø, Bandet and Veslefjellet. This should have been my first day of proper hiking but I woke to the sound of heavy rain on the outside of the tent, and it continued the same for most of the day. Not wanting to get everything soaking wet right at the start of the trip I decided to sit it out. At this point the body sized (or perhaps coffin sized) tent seemed a bad idea. 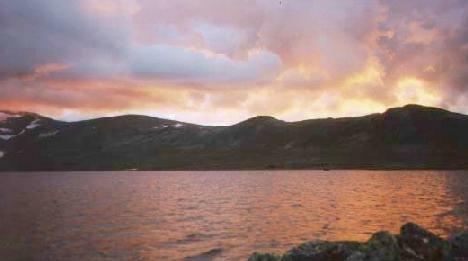 A cloudy sunset over Bessvatnet.